The time has finally come for me to say goodbye to Maggie Stiefvater’s Raven Cycle series. What a wild, magical, dark, emotional, and wonderful journey it has been! Since first reading The Raven Boys years ago I have eagerly devoured The Dream Thieves, Blue Lily, Lily Blue, and now The Raven King, the finally installment in this quartet. 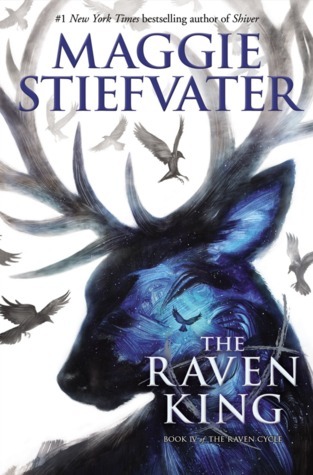 Though I had certainly enjoyed some of Stiefvater’s work prior to reading the Raven Cycle, this series showed me that sh is a truly talented writer and storyteller. While I’m sad to be leaving the fantastic world of Cabeswater, 300 Fox Way, and Henrietta, I know it won’t be the last time my eyes flit across a page written by Stiefvater. For me, the spotlight in this series has always shined on the characters. The magical elements are unique and fascinating and the writing is absolutely gorgeous, but the characters are what really brings this story to life. There are a lot of different players in this magical game, but for now I’m only going to focus on the main stars: Blue, Adam, Ronan, and Gansey. Let’s start with Blue, the strong, independent, intelligent, funny, feminist female protagonist. Blue is the heroine we should all aspire to be, the determined girl who will stand up not only for her friends but for herself as well. She also adds an important element to the story: family dynamics, specifically in a household of mostly women. 300 Fox Way offers a unique perspective on countless topics, including gender roles. The women in Blue’s household are all providers in some way, whether that be with money earned from psychic work or with invaluable knowledge of unusual things. Blue can be a dominating characters both within and beyond the domestic sphere, proving her defiance of stereotypes. She refuses to be categorized or boxed in, providing yet another reason why Blue is to be admired. Of course, one cannot mention Blue without also discussing her loyal group of friends. Just as Blue breaks through the stereotypes of her gender, so does Adam with the stigmas of his lower economic class. Though he inhabits a privileged academic world, Adam’s home life is anything but. Nevertheless, Adam is able to face his experiences of abuse and financial hardship direct, showing remarkable character development over the course of the series. Adam has always struck me as the most “real” character of the bunch, for he deals with issues that people struggle with every day. Alongside the drama of the main plot, Adam must also work several jobs while simultaneously focusing on his studies. He is a grounding presence for Ronan and Gansey, both of whom live much more privileged lives. I actually think Adam might be my favorite character; his authenticity, strong sense of conscience, and incredible dedication are hard to beat. However, I must say that Ronan is a close second. I didn’t really like Ronan at the beginning of the series– he was much too harsh, brutal, and raw for me– but I now consider him to be one of my favorite characters. Such is the magic of Stiefvater’s writing: she can uncover the humanity in even the cruelest villain. The more I learned about Ronan’s family, past, and dreaming ability, the more difficult it became for me to dislike him. Beneath that tough exterior and vulgar mouth is actually a loyal, emotional, and caring individual. He cares deeply about his family and friends and is willing to risk his own life to save them if necessary. Forget all of the unexpected plot twists– for me, Ronan is by far the most surprising aspect of this series. Nothing shows Ronan’s immense development as a character more than when he kisses Adam. To be honest, I wasn’t sure what to think when I first stumbled upon this surprising scene. It’s fantastic that different sexual orientations are represented in this story, but this relationship suddenly appeared out of the blue (yes, pun intended). One moment Adam is fuming over the blossoming romance between Blue and Gansey, and the next he is teetering on the edge of a relationship with Ronan. Perhaps there were hints dropped along the way that I have forgotten (it’s very likely, since I read these books months apart from one another), but I never saw that kiss coming. I would have liked to see more details thrown in leading up to it. Finally we come to Gansey, a king in more ways than one. I love the “king” and “royalty” imagery that Stiefvater plays with when talking about Gansey. While he is obviously a king when it comes to the ley lines, he is also like a member of royalty in his everyday life. At school he is highly regarded by his peers and teachers alike; in wealthy social circles his name brings a cheerful smile to those who speak it. Yet Gansey does not exude the uppity, righteous personality one might expect from someone so privileged. He is aware of the crown he bears, but he does not flaunt it. In this way, Gansey is also a breaker of stereotypes. I admire Gansey’s determination, his insatiable hunger for knowledge, his unfailing loyalty to those he cares about. Gansey is one king I wouldn’t mind ruling a kingdom. Overall, The Raven King is a brilliant conclusion to a remarkable series. Though it is not perfect, it nevertheless provides a captivating, satisfying ending to a story I wish could go on forever. (How strange it feels to have finished it!) The Raven King surprised me, scared me, delighted me, and ultimately made me think. I’ve said it before and I’ll say it again: Maggie Stiefvater is a supremely talented storyteller, one whose work I look forward to reading more of in the future. Would I recommend it to a friend? : Yes, especially to a fan of fantasy or even magical realism. What are your thoughts on The Raven King, the Raven Cycle series, or Maggie Stiefvater in general? Let me know in the comments section below! Wow!! Sounds like an interesting series.. Definitely going to read it soon! !